Some days or events serve as mile markers along the annual highway of life. Today is such a day. It's the first Monday of May and, therefore, time for the May meeting of the Idaho Falls Parks and Recreation Commission. This meeting serves as the lighthouse that draws our ship to safe harbor from points afar. It is a calendar date around which we plan our seasonal cycle. Without it, perhaps we would still be adrift on the waves and currents of the sea of opportunity. As it is, we wish to remain a "member in good standing" and so we dutifully return to Idaho Falls with plenty of time to get situated and ready for the May meeting. Frankly, it's amazing to us that the city AND our fellow P&R Commission members cheerfully allow our absence for five straight meetings during the winter months. But they do on the condition we show up for the May meeting. Hence, this date becomes a major mile marker in our travels. There's lots of fun stuff going on with Parks & Recreation here. We'll talk more about it all tomorrow. It's great to be back and we're excited to rejoin the various intrigues that go along with any municipal commission participation. We took a long afternoon walk on the Greenbelt yesterday. That place is so refreshing to our souls and spirits. The baby geese are coming out in their fluffy yellow down jackets. 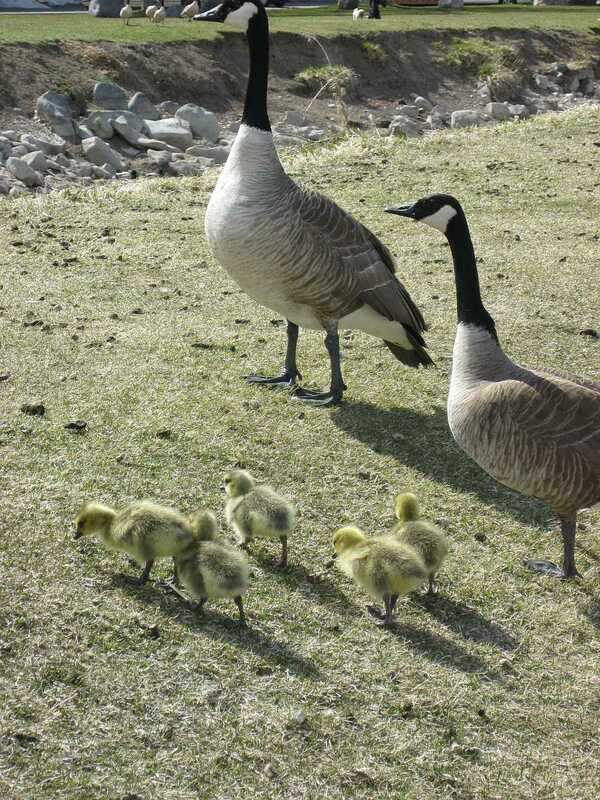 The geese here are lucky. They have a protected island upon which to nest. It's unreachable by all known natural predators and people rarely visit the island either. You can see all the geese sitting on their large white eggs out there. The males stand guard while the females tend to the eggs. When the chicks are strong enough, they swim across a channel of the Snake to join their breathern on the West Bank's Motel Row. 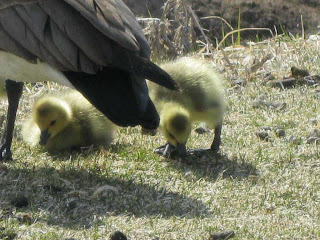 They are an annual delight to watch as they progress from a fluff ball into an adolescent and finally, a mature goose. There's a substantial flock of geese here that doesn't migrate--their free and easy life here is simply too good to leave. They have an unlimited food supply courtesy of the daily scores of people who feed them. 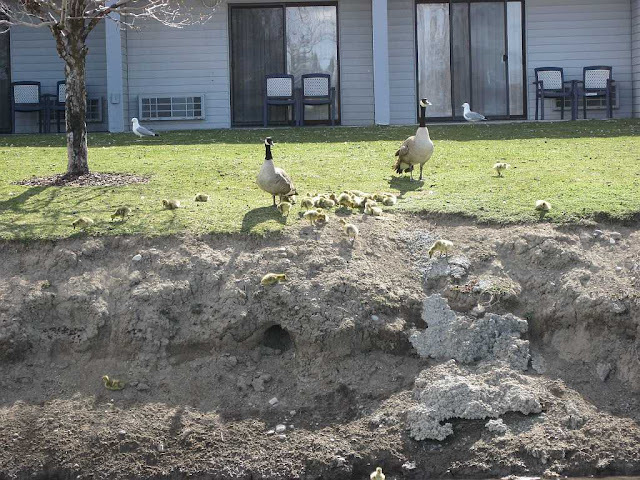 Who knows how many generations of geese are represented in this year's hatch of a new flock of the honkers? We spent more time studying an e-reader yesterday. This time is was the Amazon Kindle. We still can't bring ourselves to buy one of them and now may not EVER buy one of them. Why's that? Well, you can download "Kindle for a PC" right onto your computer for FREE. It has all of the same features as a standalone Kindle and doesn't cost a dime. So, we might as well buy a little netbook that can check email, process photos and manage our GPS rather than a Kindle. Netbooks are $200 these days and have a much bigger screen than a e-reader. Yes, a netbook is bigger and weighs more but that's really irrelevant. Yesterday, we put Kindle on this computer and downloaded a couple of free books. Amazon's Kindle book store is a LOT more daunting to shop than they say it is. They say they have a million free books but that's stretching the truth considerably. They might be out there but there's no easy way to browse them and 99.9% of them aren't owned or managed by Amazon. I did download Mark Twain's "Life On The Mississippi" yesterday and am enjoying a fine free read. We guess if you travel a lot, commute to work, or like to recline in a poolside beach chair at your posh resort, then a Kindle would be the way to go. Otherwise, why not just put the software on your computer? That's the route we're taking at this point. We went out and tested the Yagi antenna one more time. We're still not holding it correctly. We use a tripod to take photos of our use of the antenna. Our online virtual Elmer (An Elmer is a HAM mentor) then tells us what we are doing wrong (or right). It's quite an interesting process. We will continue our testing again today. We didn't go play golf yesterday--it was too cold. The temp peaked at 51 but it felt a lot colder than that. Maybe today. The 40's are just a tad too chilly to enjoy the game of golf.